This coming Wednesday, Electronic Beats Festival takes off for its biggest festival ever. 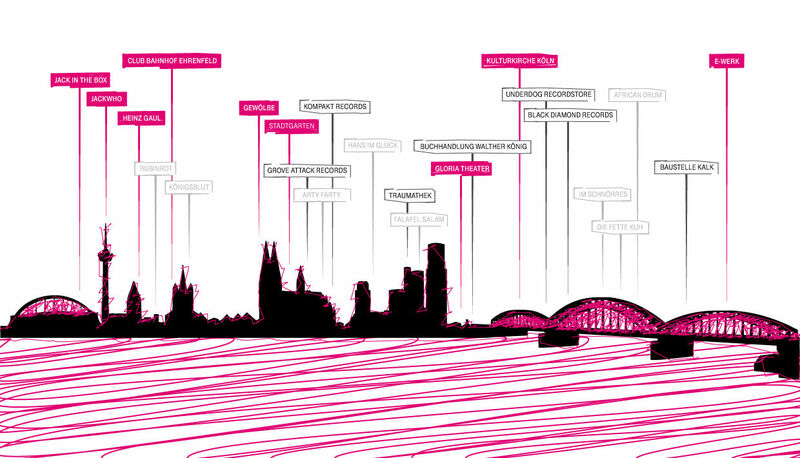 We’re bringing a jam-packed schedule of performances, markets, tours and exhibitions to beautiful Cologne. We know its hard to imagine being anywhere but festival events, but we wouldn’t want you to miss out on everything the vibrant city of Cologne has to offer by way of bars, restaurants and of course records. Everyone’s gotta eat, right? In order for you to juggle the schedule and everything in between, we’ve drawn up this useful map of recommended restaurants, shops and bars near all the major hubs. Before checking out Kerri Chandler at Gewölbe or Christian Löffler and Mohna at Stadtgarten, why not check out the seminal Kompakt record store? Or, if you want a place to return to earth after the incendiary performances of Radio Slave at Heinz Gaul or a club night at Ehrenfeld, check out legendary bars Königsblut or Rubinrot. Whether its an art bar (Arty Farty) you’re after or a delicious burger joint (Hans im Glück), we’ve got you covered. Pink labels represent official EB Festival venues. The black labels are the nearby hangouts we recommend.